In 1982 or so, we got our first home computer–an Apple II+. It had a dual floppy drive, and we used it to play Zork and write papers for school (dot-matrix printers and pin-feed perforated paper–I don’t miss either of those). In college I had an IBM clone (one that no one has ever heard of, save the woman I bought it from when she didn’t need it any more) that was portable because it had a handle. It weighed 24 pounds, but it had a handle. But for whatever reason I couldn’t save a paper longer than five pages, so it didn’t last long once I left my undergrad days. When I got to grad school, I knew I wanted to go back to Apple. The only way to buy one was through the athletic department, and somehow I was able to make that work. But it wasn’t like you went into a store and picked it up–no, you had to order it and wait for it to arrive. So I placed my order for whatever was available at that point, and I waited. And waited. And waited. Finally, the woman in charge of computer orders called me and said, “Sorry it’s taking so long. 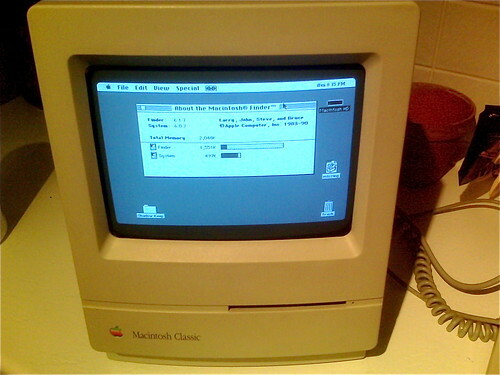 But I wanted to check and see if you wanted to upgrade to a Mac Classic. It’s got better memory and it’s cheaper.” Sold! I used that computer for a long time. When I first got Internet access, it took me forever to set up. Between the out-of-date instructions and dial-up (and only one phone line in my apartment), there was a lot of plugging and unplugging the modem to call for support and then re-connect to do what they said. The guys at the ISP said that while they were sorry I was having so much trouble, it was really helping them pinpoint where their instructions needed to be revised. But even so, one of them finally said (during what was probably my 10th call), “Kathy? Why are you at home setting up Internet access at 9 p.m. on a Saturday?) I said, “I had no idea it would take five hours.” And what I thought was, Sheesh, at least he’s at work. I’m doing this on my own time. Oh, and I could only get text-based sites. Fortunately there were a lot of them. I planned an entire out-of-state trip online, using only text-based sites. But the Web kept developing, and I had to buy a new computer that would display visuals. Naturally, I stuck with Mac. It helped that we had them at work, and that our license allowed me to install Word on my home computer, so that I didn’t have to buy my own copy (I still miss Word 5.1, by the way. Just saying.) for when I needed to work from home. A few computers later, and I was buying the G4 desktop that we still have at home. It’s old, but it works like a charm. My MacBook works, too–it’s just got that old Motorola chip that keeps me from upgrading the OS, which keeps me from upgrading the software, which means that it won’t talk to my iPod Touch any more. My new laptop isn’t a Mac. Our budget and priorities have changed, and I just couldn’t justify buying a Mac, much as I wanted to. Photo by fuzzz, via Flickr.